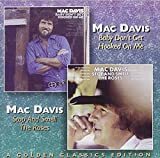 These are lyrics by Mac Davis that we think are kind of funny. Irony; a man who is the epitome of egotistical states he doesn't know what that means. A perfect picture of the '70s man, shirt open to waist, certain all desire him.